I was blessed to begin my marriage as a Christian with a believing husband. We started our relationship with the determination to do things God’s way, and that has not changed. Both of us were raised by parents who have given us amazing examples of what a Christ-centered marriage should be. Our parents taught us about submitting to and respecting each other. They taught us what selfless love looks like, and how essential forgiveness is. Our parents prepared us well. But they couldn’t give us exact instructions for everything we would encounter in married life. I didn’t realize that living so closely with someone else would lay bare all my best and worst qualities. I can be lazy, insensitive, rude, extremely selfish, and basically everything that 1 Corinthians 13 says love is not. On the other hand, I’ve found that I can be selfless at times, like when I get up early when I don’t have to in order to make breakfast for my husband, when I learn to play a video game so I can do something with him that he likes, and when I take care of him when he’s really sick. My husband does similar things for me! I never knew how much I could love or how much I could be loved until I knew my husband. The way he loves me even when I’m at my most unlovable is an amazing reminder of how God loves me unconditionally. The love of my husband isn’t a replacement for the love of Christ, of course, but it’s a picture of the love God has for me. 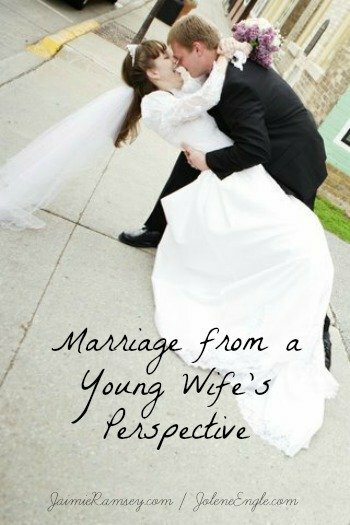 As a young couple (we were married when he was 20 and I was almost 20), we’ve faced most of the same obstacles any recently-married couple does, such as differences in how we deal with money, different habits, learning how to relate to each other sexually, learning to communicate clearly despite our different methods of communication. We mess up. We hurt each other. We say the wrong thing. We act thoughtlessly and selfishly. No matter how we sin against each other, there is always forgiveness. We are able to forgive each other because Christ has forgiven us of sins far greater than the ones we commit against each other. We are able to love each other because God loves us, and that love flows through us to each other. We made a commitment very early in our marriage that the word “divorce” would never be spoken. It’s simply not an option, ever. We’re “stuck with each other,” because we made a commitment to each other and to God that we would be together and faithful to each other “till death parts us.” It’s only by the grace of God that we will be able to keep that promise. It’s because of his forgiveness that we’re able to forgive each other and move past our mistakes. It is his love that will keep us together and loving each other. I am so glad my husband and I decided to get married when we did. Yes, we were young, but marrying at a young age has given us the opportunity to finish our growing-up years together. We are maturing in our faith and in other ways as a couple, instead of by ourselves. Yes, we’re still developing as individuals, but we’re going to be together as one flesh for the rest of our lives. It just made sense to start that life sooner rather than later. And we don’t regret a minute of it. Sure, we’ve had struggles, and I know we’ll face more that right now I can’t even imagine. But God has already proved himself constantly faithful, even when we ignore him. We can trust absolutely that he has our lives in his hands, and that he will carry us through no matter what life may bring. This is absolutely beautiful, Jaimie! Thank you! !